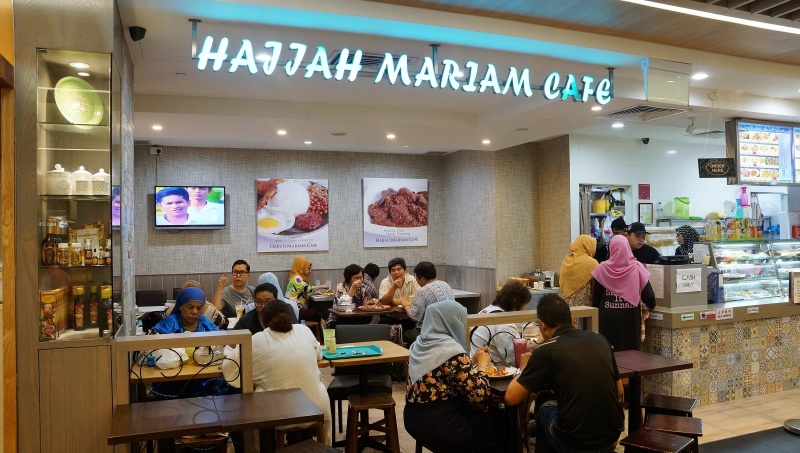 Hajjah Mariam Café is a Malay Halal food outlet operating two adjacent shops at the basement of Westgate mall. While they do offer traditional Malay dishes, the café makes a difference by specialising in nasi ambeng – a fragrant rice dish consisting of white rice served with beef rendang, chicken, vegetables or pickled acar, serunding (fried grated coconut), begedil (potato patty), sambal goreng as well as other dishes. You can top the rice with spicy gravy for a more zesty taste. 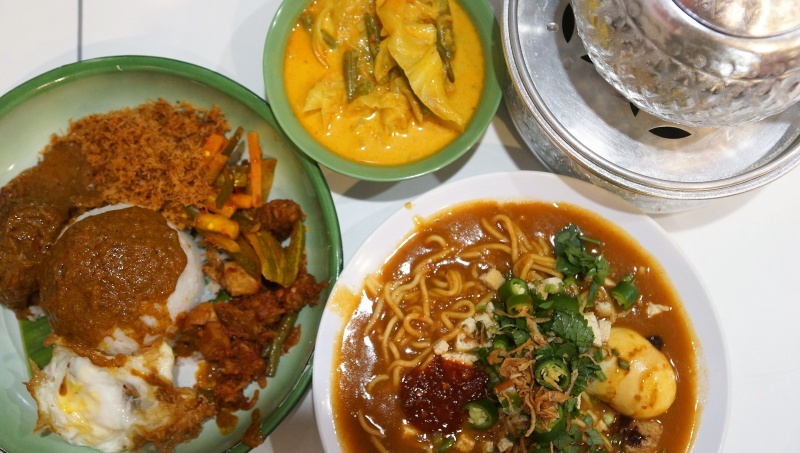 Apart from the nasi ambeng sets, you also have a choice of side dishes like assorted vegetables, or traditional items like mee rebus. You can also upgrade your selections with pricier choices like cow lungs or brinjal. 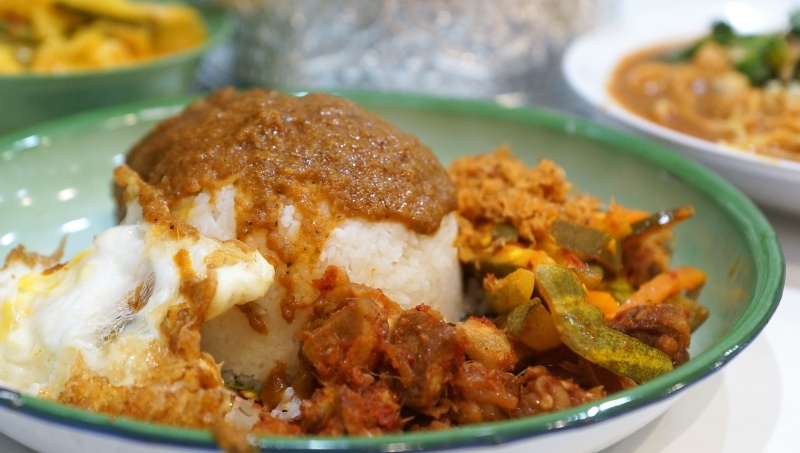 Nasi ambeng is a popular Javanese-Malay dish that’s normally served during festive occasions. The uniqueness of nasi ambeng comes in its size. Rather than a single serving, a plate of nasi ambeng can be enjoyed together with up to six diners! Can you imagine the size and the amount of food on the plate to fill six stomachs at one go? We would have loved to try the biggest serving of nasi ambeng but with only three of us, we had to settle with less. The nasi ambeng comes at a variety of serving sizes and prices. The smallest solo to two pax size ranges $8.5/11.5/17/23 depending on ingredients, while the biggest size for three to four pax has a price range of $26.5/35.5/35/47. Unfortunately there is no six pax serving size here yet. In general, the dishes are decent and flavourful, we opted for the beef but the meat was tough and not fork-tender which is a big drawback. Besides nasi ambeng, Hajjah Mariam Café carries other Malay traditional favourites eg. mee rebus, nasi lemak, lontong kering, mee soto etc. 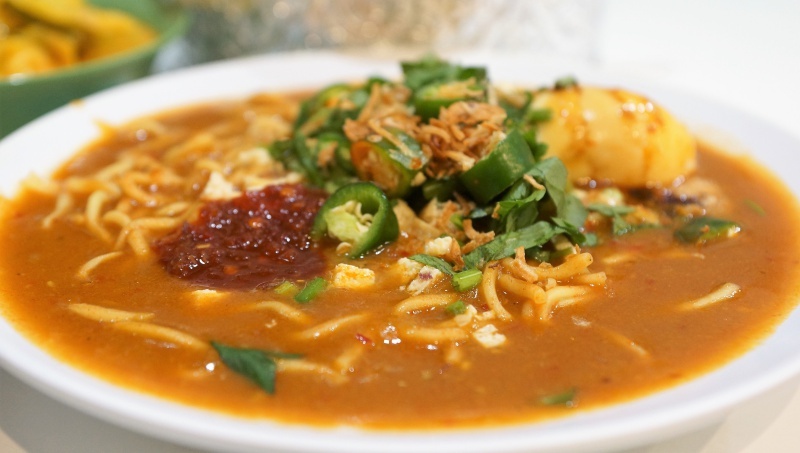 We tried the mee rebus ($4.90) as well, the mee rebus was topped with boiled egg, celery, green chilli, fried bean curd cubes and sprinkled with fried shallot. It has a savoury flavour rather than the usual sweet taste with a gravy that is rich in seasoning and tasty. Besides the nasi ambeng, it is another dish worth a try. 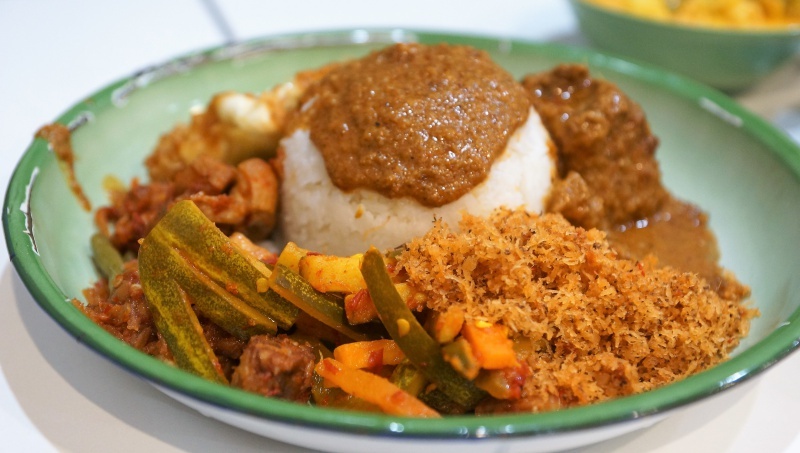 Hajjah Mariam Café Nasi Ambeng is decent in taste, however, what is most important with the creation of the dish is to foster togetherness and bonding among friends or families which is the true meaning of this dish.